chewing everything, so she can do her inspection of the observatory grounds, that alone takes up any free outside time. So, let's return to consider some of the measurement theory behind the image shown last time of the spectrum of the daytime sky. Remember that image showed the light intensity versus light wavelength and it was obtained with my laboratory spectrometer by just pointing the fiber optic cable out the window. The optical cable has a 50 micrometer diameter opening through which all the daytime sky light enters the spectrometer. This is a very small diameter. The average human hair has diameter also of about 50 micrometers so the fiber is seen to be very small, and yet enough light is received in a 2 second exposure to see the spectrum and all of the absorption lines in the solar spectrum. I jumped to the conclusion that if I were to point the fiber at the moon, I would be able to get a spectrum of the reflected light from the moon, which would be really interesting to compare that spectrum with the spectrum observed from the sky. I had an inkling that the moon is a little bit brighter than the daytime sky so wouldn't I be able to just as readily get a reflected light spectrum? While I was busy trying to calculate the brightness of the sky, Resident Astronomer Peggy chided me that I should just go outside and look at the moon in the daylight and see how much brighter it is. Wow, she sure was right. No need to calculate if the moon is brighter than the daytime sky. Just go outside and take a look. Yes indeed, as you probably recall, you can see the moon during the daytime and it is indeed brighter than the daytime sky. So, without trying any more calculation, I rushed out and got some 1 inch pipe sections, which just happened to have the right diameter for my spectrometer collimator. I used two sections of pipe, one to hold the collimator and the other for me to sight through so the moon is centered in view. See the attached photo. The collimator accepts light over a half inch lens and directs it into the fiber optic cable. The collimator is used in the laboratory to collect the light that passes through a liquid sample. At the time I didn't stop to think that the collimator only works when the incoming light is parallel to the fiber optic bore line and if there was even as small of offset of 0.1 degrees, then the collimator lens image would miss the fiber cable input completely. So, when I attached the pipes to my tripod and pointed at the moon and took a spectrum sample, you guess it, it was a complete and total flop. 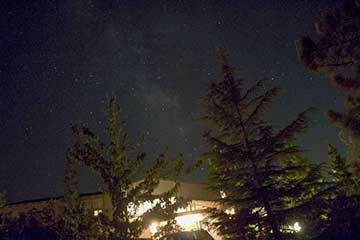 I increased the spectrometer to 60 seconds, more than 30 times as long as used for the skyglow measurement. Still nothing at all and the data collected while looking at the moon was not observed to be any different than a similar 60 second exposure with the pipe entrance complexly blocked off. I even tried to move the pointing angle slightly and continuously over the 60 second exposure in an attempt to get a near perfect orientation with the moon, however short, but again to no avail. So what happened? Why was this another flop? Why couldn't I see the moon in the spectrum? Well, the answer is hidden in the additional analysis that I should have done earlier. As a former systems engineer, I knew better. I should have performed some preliminary calculations to ensure that the proposed pipe design had a chance of seeing the moon. But no, I was too much in hobbyist experimental mode, and jumped immediately into building something. It's a bit amusing to think that I could remember that the internal diameter of 1 inch, Schedule 40 pipe, would just fit my collimator, but that the need to do a bit more systems engineering escaped my attention. So what is the explanation. Well, as my old friend, Still into Control Systems, Gene, is accustomed to saying "physics and calculation will win out over hope and superstition every time". Yes, once I did the calculations, the answer as to why the measurement did not work, did not have a chance of working, was apparent. The answer has to do with how light enters the 50 micrometer core of the fiber optic cable. It turns out that an optical fiber works by internal reflection that keeps all light entering the fiber propagating all the way through and along the fiber. This internal reflection design also means that any light that is close to the optical axis of the fiber can enter the fiber and be propagated. For a typical fiber design this angle of acceptance can be quite large and for the fiber that I am using, any light that shines within a 24 degree come around the fiber axis will be accepted. So, when the fiber is pointed at an extended object, like the sky, all the skylight within this 24 degree come is accepted and passed on to the spectrometer. When it comes to stars, which are considered point sources, the moon begins to look like an extended object, but nowhere near like the extended object nature of the sky. Now, amateurs now that the moon extends an angle of about 1/2 degree and that the amount of light received by a telescope goes up by the square of the telescope diameter. So comparing the area of the moon to the area of the sky entering the fiber cable, we see that the amount of light from the moon is (24/0.5) squared or 2300 times less light energy than from the sky. This occurs because of the area emitting the light is so much smaller, even though the moon is a little bit brighter. So you can't just point the fiber at the moon and hope to get much light from the moon. Even though the angle of acceptance, reduces the need for high pointing accuracy, the size of the moon means much less energy is received from the moon compared to the sky. Even with the collimator, it's small 1/2 inch entrance diameter receives even less energy. So even when the collimator is used to attempt getting more light, it's pointing accuracy requirement is so severe that hardly any light is passed on to the spectrometer. So the moral of the story in the continuing saga of an amateur physicist wannabe is to first of all do some calculations to check if your hobbyist intuition has a chance of working before it's built. Another of my hobbyist intuitions was that the daytime moon was maybe 2 magnitude brighter than the daytime sky. The reported magnitude for the moon is -12.2. How close to reality is this intuition? Well, to check, I quickly braved the cold this morning, just after sunrise to take the attached photo of the moon. The exposure was taken at 7:27 AM with shutter set to 1/4000 of a second so it appears kind of dark, but in reality it was really quite light. A quick review of the intensity of pixels on the image of the moon were on average about 44% brighter than the average pixels on the sky. This difference in brightness corresponds to about 0.4 difference in magnitude. So, to a first approximation, the daylight sky appears at about -11.8 magnitude. One of my future goals is to work through all the technicalities of measuring magnitudes, which is a bit more involved that the simple approach I used here.